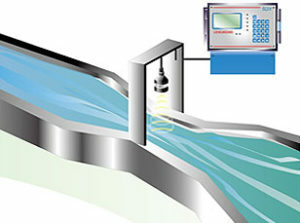 Ultrasonic Open Channel Flowmeter is a high precision flow measurement instrument, which use Transit Time Ultrasound principle to measure the flow in a variety of Flumes, Weirs or Troughs. The sensor is a transceiver which emits high frequency sound, which hits the medium surface and returns back to the sensor receiver. The time of travel of the ultrasound is inversely proportional to the height of the flowing medium. This way the height of the flowing medium is calculated. And with the algorithms programmed the Height, Flowrate and Total Flow are calculated and displayed..